At exactly the same speed at which cities are growing, opportunities seem to be growing with them. As opportunities grow, infrastructure is pushed to grow as well. And at that fast a pace, with hundreds of offices cropping up each day, breaking away from the norm is not an easy thing to do. Introducing innovation into the design of a workspace is a challenge in more ways than one. For a start, there are the limitations of space and time to begin with. 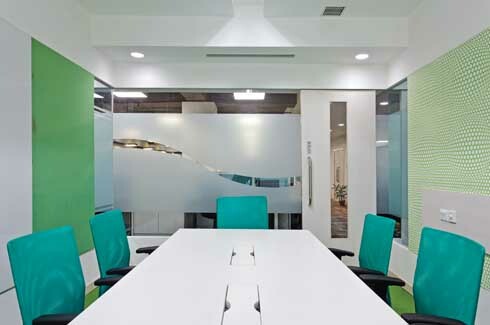 The architectural firm of AVA design studio did not only overcome these two factors but a lot more as well to arrive at a perfect outcome in the case of this office for Emeter India Pvt. Ltd. 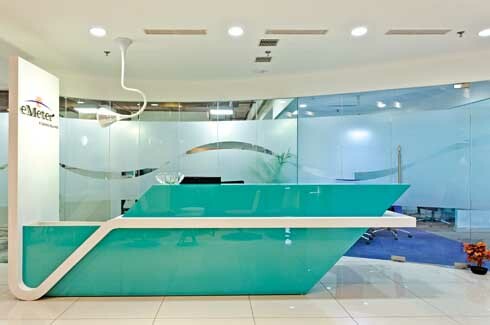 The entrance or the reception area of the office has a very smart and neat look thanks to its glass backdrop. 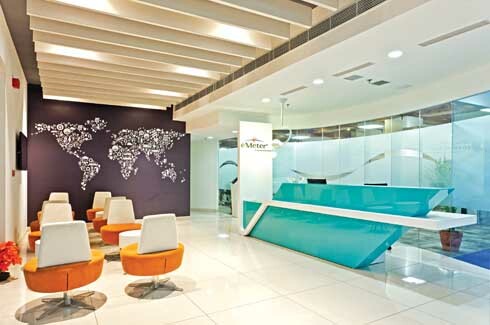 The reception desk with the wall treatment behind it has been designed keeping in mind the brand image of Siemens whose subsidiary Emeter is. The reception is a key place and it is here that its design should clearly reflect the company’s identity. As we see in this case it has been used to display the distinction of Emeter from others of its kind. Isn’t it lovely when a space feels like it has been dedicated for one sole purpose, like each and every corner is devoted to fulfill just that? It’s definitely good to include elements of comfort but this one carefully stays away from being too cosy probably to avoid attracting those post lunch naps! Congestion free, light and vibrant; an office where you enjoy your responsibilities, not get weighed down by them. And whoever said being professional means being black and white and boring? There’s a touch of colour in every room. 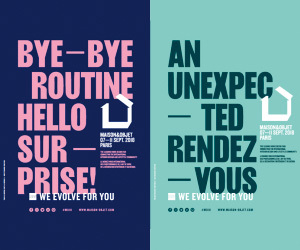 Pink, blue, mauve and more; it just compliments the rest of the theme that speaks of understated style; it enlivens the work space and in turn the work culture. Every room has a distinctly different design, each one with its one characteristic element. 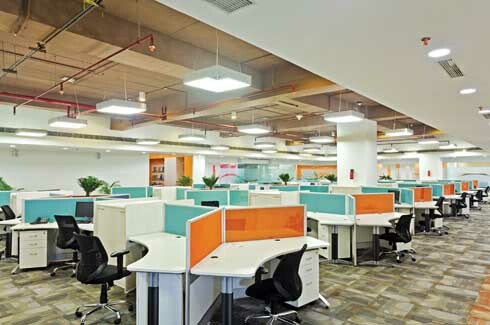 The open office with its thoughtfully arranged cubicles has no false ceiling and the soffit of the slab is exposed. This creates an ideal situation for the lighting. 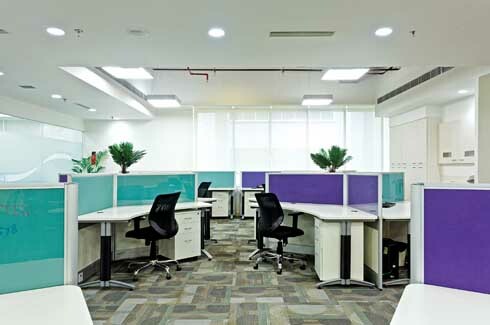 With the changing times the trends in office design have changed as well due to the palpable change in work culture. The office nowadays is required to provide a space where the employees can interact with each other and at the same time have their own comfortable personal space. Since we spend a major part of our days in offices nowadays, it is very essential to have one that encourages creative freedom and allows for optimum performance in the hours spent there. A dash of colour everywhere; it doesn’t take the focus away, but rather sews the theme together. Maximum convenience has become the mantra here. Also clutter has been avoided as that takes up valuable space and proves to be a hindrance in the way of easy ambulation; there are places for exclusive processes and there are rooms for multi tasking too. 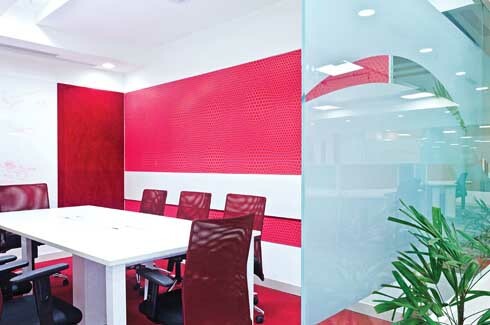 The clever use of barriers and screens smoothly facilitates all modern office functions in this corporate space. 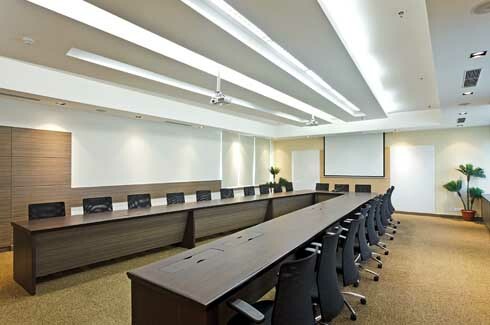 The conference rooms here have been built anticipating different situation that might arise. Partitions are a smart option to define areas, the more defined the borders are the better it is, as shown here. The choice of furniture is another well planned element that has been implemented in the design; it is comfortable, functional and also efficient in terms of space usage. Shelves have been more or less done away with to avoid clutter. Equipment storage has also been planned very carefully, aiding accessibility in every way. Lighting is very crucial in work areas. Ceiling lights and natural light from windows are seen to be the best options as they use no space. In addition to these, the designers have also included other innovative solutions wherever space and access to natural lighting is a bit of an inconvenience, for example, the drop down pendant lighting. The colours and the glass backdrop have a fluid character about them. An office, in modern times, has essentially become a place where you aspire to grow, as a person or as a team. It becomes your public face and thus it becomes all the more necessary for it to reflect your ideals. What this office has achieved, and something that not every office does, is that it has balanced a few comforts that make you feel at home, with a few factors that push you to the best of your productivity. This goes on to prove that you can always fine tune ideas and adopt a new approach to create an office space that not only doesn’t cross the budget but also doesn’t extend beyond the decided timeline. All this with the minimum of fuss!